Few diagnoses are as confusing to dog owners as seborrhea. Part of the confusion arises because most dogs said to have this disorder do not, in fact, have seborrhea. Seborrhea has become a catch-all term for any case of dry, scaly, smelly, or greasy skin, regardless of cause. Unfortunately, most skin problems that cause any degree of inflammation result in these changes, so that most, at one time or another, can get labeled as “seborrhea.” It is one of those words, like dermatitis or eczema, that is used frequently but means little. In fact, the problem can be compounded, because dry skin is often referred to as seborrhea sicca and oily skin as seborrhea oleosa, as though that provides important additional information, and red, inflamed skin may be called seborrheic dermatitis. The problem is compounded further because there is an actual condition known as seborrhea, which is extremely rare in dogs. So seborrhea as a description is phenomenally common, but probably less than 1% of dogs so labeled actually have true seborrhea. The proper description for this collection of problems is keratinization disorders. 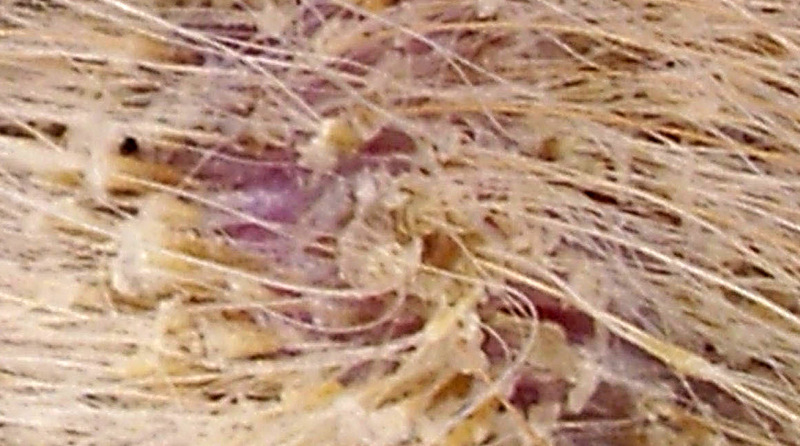 Keratin is the scale on the surface of the skin, and all the symptoms listed above can be explained by some abnormality of the arrangement of this keratin on the skin surface. Some arrangements make the skin dry, others greasy, and all can make the skin inflamed. Since most of the problems that cause keratinization disorders have nothing to do with the sebaceous glands, seborrhea (which means “flow of sebum”) is a poor diagnosis most of the time. Allergies can commonly result in kerintinization disorders, as can hormonal problems, nutritional problems, inherited problems, infections, auto-immune diseases, and even some cancers. Some animals undoubtedly are born with a defect in their keratinization process (e.g., ichthyosis, epidermal dysplasia, seborrhea), but by far, most keratinization disorders occur secondary to underlying problems. It is therefore critical not to stop with a diagnosis of keratinization disorder until the cause for it has been established. Treat the cause and, more often than not, the keratinization disorder will take care of itself. Why do animals respond this way to such a variety of underlying problems? Most people shed millions of dead skin cells into the environment every day, and the dog is no different. The skin is constantly in a process of renewal and there is an orderly progression for a plump epidermal cell to evolve into dead surface scale. This process takes about twenty-one days, then another twenty-one days for the scale to shed into the environment. If some problem disturbs this sequence and scale collects haphazardly on the skin surface, sometimes the scale is greasy in texture and other times it is dry like dandruff. There can be scaling, crusting, and hair loss. Normal bacteria on the skin surface increase in number as they have more debris on which to feed; as they break down the fatty substances in the scale they give off a rancid odor. As the bacteria flourish further, they can cause infections on the skin surface. Dogs often damage these areas even more by scratching. Diagnosing keratinization disorders properly is an involved process, because so many different possibilities exist. Some problems are more common in specific breeds, and this can help direct diagnostic efforts. In other cases, a step-by-step approach might include skin scrapings, bacterial and fungal cultures, blood tests, allergy assessment, and biopsies. A non-specific diagnosis of keratinization disorder should only be made after all other possible underlying causes have been considered and excluded. Treatment is very successful when the underlying provoking factors have been identified and corrected. Thus, hypothyroidism can be corrected by thyroid replacement therapy, nutritional problems by dietary correction, infections by antibiotic therapy, etc. For disorders in which an underlying condition cannot be identified, treatment must be vigorous and intensive, though in most cases the animal’s overall health is not compromised. These animals may look dreadful, but only rarely is the keratinization disorder associated with internal problems. Frequent bathing and topical treatment of the skin, as well as perhaps dietary supplementation, may make the condition more tolerable if a more specific therapy in not available. This usually means bathing from twice weekly to once every few weeks with an antiseborrheic shampoo. Ingredients considered antiseborrheic include sulfur, salicylic acid, tar, selenium sulfide, and benzoyl peroxide. One should always use tar shampoos with some caution, since they may irritate the skin and can result in contact dermatitis in the person doing the bathing—always wear gloves when using tar shampoos. Benzoyl peroxide, which is a common ingredient in acne products, can dry the skin and can bleach many fabrics. Therefore, it should not be used in dogs with overly dry skin unless the bath is followed by an emollient rinse or spray. Benzoyl peroxides are particularly helpful in cases where the scale collects in the hair follicles, such as it does in Schnauzer comedo syndrome and vitamin A-responsive dermatosis. For best effect, all antiseborrheic shampoos shoule be worked into then left on the animal’s skin (not just the haircoat) for 5-15 minutes after thorough lathering, or as recommended by the manufacturer. Proper rinsing is essential, and animals preferably should be air-dried or towel-dried rather than blown dry. Dogs with keratinization disorders often benefit from a good basic diet, and supplementing that diet with essential fatty acids on a regular basis may help alleviate some of the scaling. These supplements might include sources of gamma-linolenic acid (evening primrose oil, borage oil, blackcurrant oil, sunflower oil) or marine lipids (fish oils) and combination products are available commercially (e.g., Omega Pet, DermCaps, EFA-Z Plus). Finally, some keratinization disorders have responded to vitamin A or its more potent, synthetic cousins, the retinoids. Excerpted from Guide to Skin and Haircoat Problems in Dogs by Lowell Ackerman, DVM. This entry was posted in dog health and tagged dry skin in dogs, greasy skin in dogs, keratinization disorders in dogs, keratinization in dogs, scaly skin in dogs, seborrhea in dogs, skin condition in dogs. Bookmark the permalink.